A Facebook page has shared what it deems is evidence that late president Benigno Aquino Jr. knew that he was going to die before he even got on a plane home. What it shared was a video clip of an Antonio Gonzalez, an Aquino supporter, admitting that Aquino told him before he died that Gonzalez was never going to see him again after he descended the plane he was riding home. "Ninoy knew exactly how,where, and when he was killed." Listen to what Antonio Gonzalez has to say," the blog said. "This means he sacrificed himself, ninoy planned it, did he set-up his own assassination to give the blame to the Marcoses. Ninoy Secret dirty tactics! Ninoy mislead the Filipino people and mislead the Philippine history. 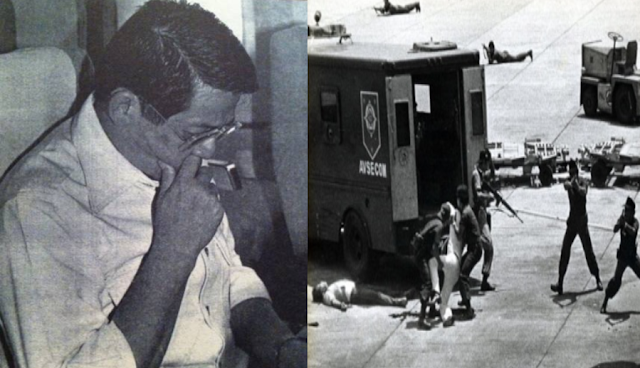 NINOY STAGED HIS OWN DEATH," it added. The conspiracy that Aquino plotted his own death to oust the Marcoses is not knew, with several testimonies telling the narrative throughout the years from his death. A soldier, Master Sergeant Pablo Martinez convicted for the assassination of Benigno “Ninoy” Aquino stands by his confession that Eduardo “Danding” Cojuangco ordered the killing of the opposition leader upon his return from exile in 1983. In 1994, it was reported that Martinez became a born-again Christian and confessed to his fellow prisoners that he “didn’t want to lie anymore.” In a Time magazine story (Feb. 2006), Martinez said that Rolando Galman, the alleged assassin who was killed, told him that the plot was ordered by Cojuangco. Twenty five years after the assassination, the mystery of Aquino's death remains unsolved.